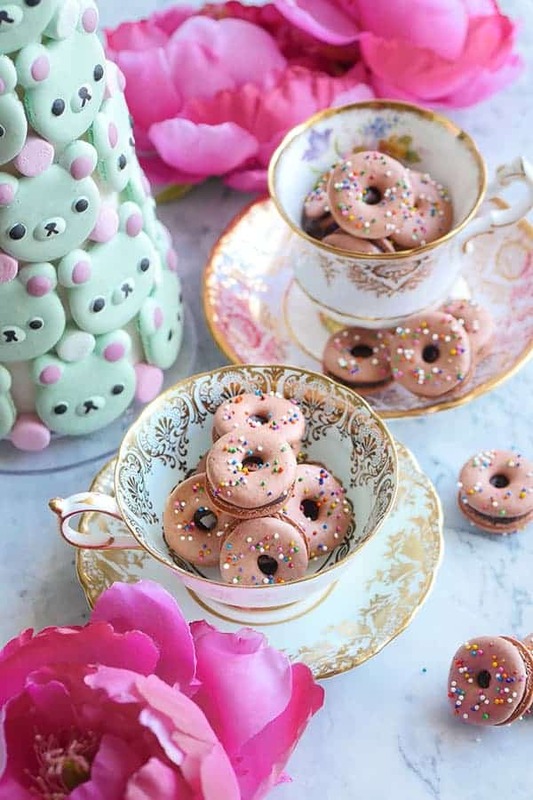 Wake Up to a Big Cup of Coffee… Macarons! 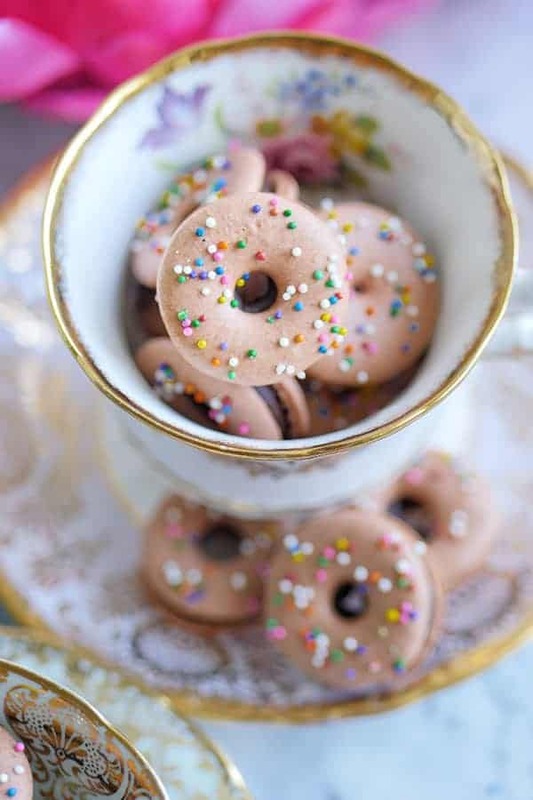 What is better than starting your morning with a big cup of coffee macarons? Rich, dark and sweet, it’s the perfect way to brighten up anyone’s day. These coffee macarons are packed with flavour since there is coffee and chocolate not only in the filling but in the macaron shells as well! It’s not always easy to find an appropriate ingredient that can be added into the shells for extra flavour. You run the risk of compromising the integrity of the shell when adapting the recipe with added ingredients, sometimes it can cause blotchiness or cracks. After a few test runs, I’m happy to introduce my version of coffee macarons. 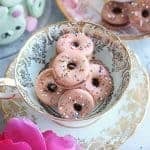 For this project, I piped the macarons into a fun donut shape and sprinkled some rainbow nonpareils on top to make them extra playful. Just imagine the look on your friend or co-worker’s faces when you bring out a a box of donut macarons for a morning pick-me-up. 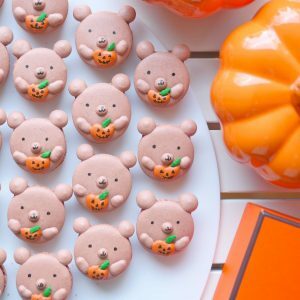 Besides being perfectly presentable in a box, they also work very well in a macaron bouquet that’s ready for gift-giving for a birthday or special event. I posted some pictures of the bouquet at the end of the post. Use a smaller piping tip. Wilton round #10 piping tip was used for these donuts. Pipe batter onto silicone mats instead of paper since they hold special shapes so much better. Be sure to leave plenty of room in the center devoid of batter for the donut “hole”. The batter tends to run into the center as it settles so leave more room than you think is needed. Wait until the shells become completely dry before baking to prevent cracking. This step is especially crucial for donut macarons during baking since the batter likes to escape through the center if it is not completely dry. 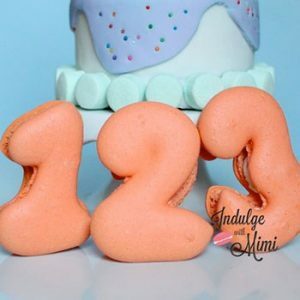 This is a fun and flavourful macaron that will be sure to please the coffee lover in your life. I hope you enjoy making it. Coffee donut macarons are rich, dark and sweet, the perfect way to brighten up anyone's day. These coffee macarons are packed with flavour since there is coffee and chocolate not only in the filling but in the macaron shells as well! 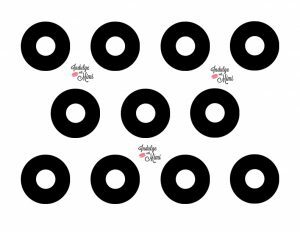 Print out the donut macaron template provided in post. Set aged egg whites out at room temperature. Pulse almond flour, powdered sugar, cocoa powder and coffee crystals together in a food processor. Sift the dry mixture. Discard big pieces of almond that can't be sifted. 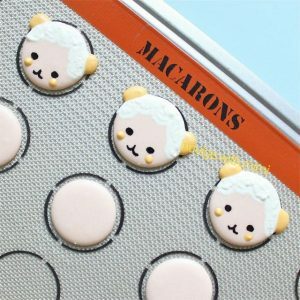 IF YOU ARE NEW TO MAKING MACARONS, please read the instructions to my BEST MACARON RECIPE before attempting to follow the rest of the instructions since it is condensed for the advanced macaron baker. With the balloon whisk attached, whip the room temperature egg whites on low-medium speed. Add cream of tartar when it becomes foamy. Turn up the speed to medium. Once the whisk starts to leave tracks in the egg whites, add sugar a little at a time. Turn the speed up to medium-high and whip until firm peaks. Stop mixer and add the brown gel colour to the meringue. Turn mixer back on and whip until colour is fully incorporated and the meringue has reached stiff peaks. Fold the almond flour and meringue together until the batter becomes a "lava" or honey-like consistency. 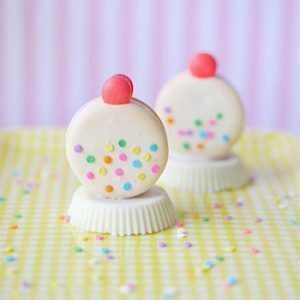 Transfer batter into a piping bag fitted with a #10 round piping tip. On parchment paper or silicone mats, pipe out the donut shape. Add rainbow sprinkles on top of the donut macaron shells before it dries completely. Wait until the shells become completely dry before baking. Bake at 325F for 12-14 minutes. Every oven is different, you may need to adjust your own temperature settings. 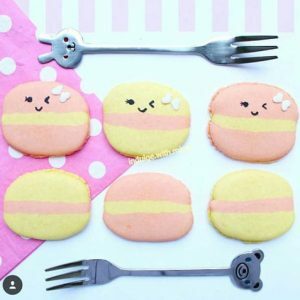 Please read How to Use Home Oven Properly for Baking Macarons if you are unsure. Once baked, let cool completely before removing from the baking mat/parchment paper. 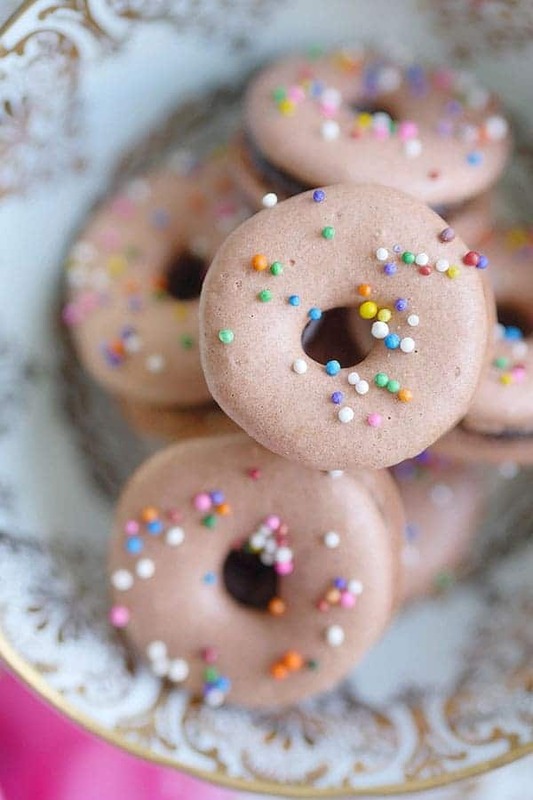 Pair two similar sized donut macaron shells together, fill them with the Coffee Chocolate Ganache filling. Place in an airtight container in the fridge and wait for it to set before decorating. Chop up chocolate into small pieces, place in a bowl with the butter. In a small pot bring the heavy cream and instant coffee crystals to a light simmer. Take off heat. Pour over chopped chocolate and butter, let it sit for 1 minute. Stir until incorporated. Add vanilla extract and stir until fully incorporated. Let it cool to set before transferring to piping bag. * Most cocoa powders purchased at supermarkets in North America will be natural cocoa powders, not Dutch Process cocoa powder. 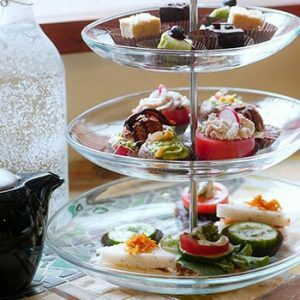 ** The brand of coffee crystals used in this recipe can be found in the shopping list at the end of this post. *** Coffee contains caffeine, take caution when serving to children or pregnant women. 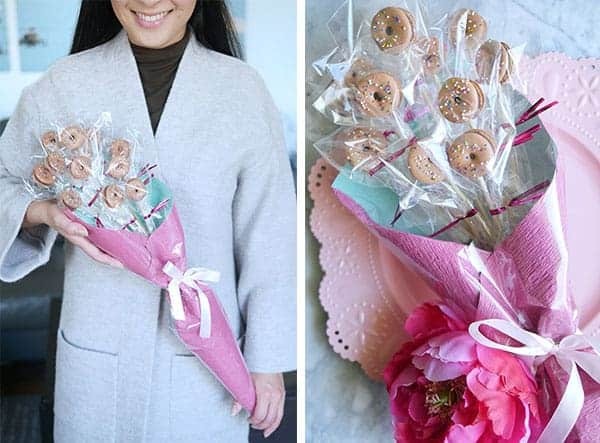 Coffee donut macarons made into a pretty bouquet for a birthday or special occasion. Available exclusively for my newsletter subscribers. Just sign up for the newsletter and wait for the double opt-in confirmation email. Confirm your subscription and you’ll be sent the password to the Subscriber’s Only Area. Shopping list for this project. Disclosure: affiliate links. Is there an actual donut template in the subscriber’s area? If there is, I can’t seem to find it. If not, which size of round template do you recommend using as a template? I don’t see the shopping list for this recipe. 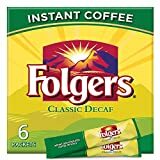 What type of coffee crystals did you use? Also, do you have a brand for the chocolate for the ganache?